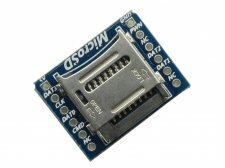 This is a Micro SD(TF) card breakout board, and it will allow you to breakout the MMC socket to a 2.54mm standard 2 x 5-pin header. It is compatible with TF SD card (commonly used in Mobile Phone) which is the most tiny card in the market. It can work with 5V power supply, and both 5V/3.3V IO operation level. It can be controlled directly by a wide range of microcontrollers such as Arduino, AVR, PIC, ARM and MSP430. PWN power control PIN, low voltage disable the power supply.